Why: My brother and high school bestie wanted to see it. Full disclosure: I actually planned to skip this show. 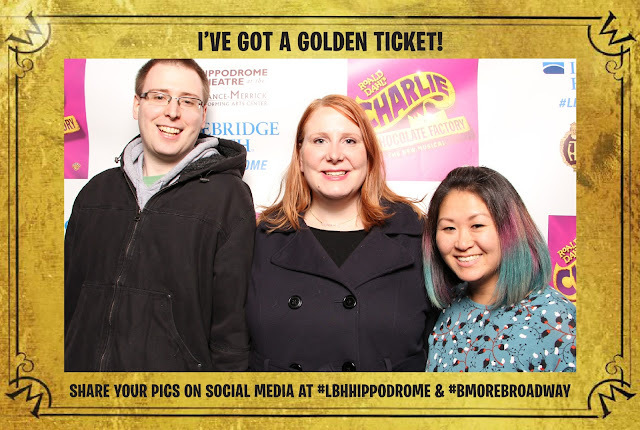 It was included in my Hippodrome Season subscription, but I'd never particularly warmed up to the idea of Charlie as a Broadway musical even though I'm fond of the classic Gene Wilder film. However, when I offered a few close friends and family the opportunity to take advantage of my early access to tickets, my friend and brother both immediately jumped at this one. I couldn't just leave them alone now, could I? That being said, there were some decisions made that made the experience a fun one, starting with a photo booth available to all patrons in the lobby. Good bonus to set the tone! As far as the actual show is concerned, what was done best was the interpretation of the children's characters; they were so modern, vibrant, and fun! Each got an over-the-top introduction number, and I'd say those were the highlight of the show. The parents were equally fun and lended some sly moments of adult humor throughout the show. We all agreed that while we felt the show as a whole was underwhelming for us, those moments were most enjoyable. Another friend of mine was in attendance with young nieces who found the show more entertaining, so it may just be an option better suited to children than adults. If you've seen the show, I'd love to hear your thoughts in the comments! Check out other shows I've enjoyed here.